The Spot a World Cup Skateboarding event. 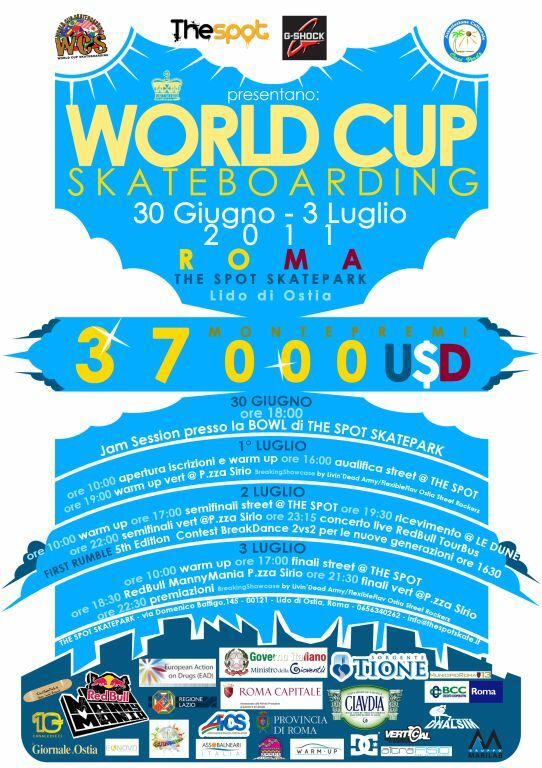 The Spot and ACS Green Oasis announce that once again Rome, Italy will host the G-Shock - World Cup Skateboarding 2011 – at The Spot Paradise, from June 30 to July 3. After the sulphurous atmosphere evoked in "The Spot Hell" in 2010, the Spot skateboarding decided to offer both the public and the athletes an intoxicating atmosphere paradise! All this jumping directly without passing through Purgatory ... So, the theme for this fourth edition, is "The Spot Paradise." This year the Italian stage of the G-Shock - World Cup Skateboarding 2011 - The Spot Paradise is part of the 5 events (Los Angeles XGames, Maloof Money Cup in Sacramento, Bondi Beach Australia, Rome and Rio de Janeiro) that assign points in the standings in the world circuit. Beyond this, available to athletes a rich prize of € 25000. More than 100 skateboarders, men and women from 5 continents will compete in three special canonical skateboard freestyle: "street" and "bowl" at The Spot Skatepark in Ostia, and "vert" at the largest Roman waterfront square, Piazza Sirius . Sandro Dias at The Spot. Among the most outstanding skaters this year include the "900 Man" Sandro Dias (Brazil silver medal at Asin Xgames 2011), and as a true skateboard legend Mike Vallely (USA), Daniel Vieira (Brazil, winner in 2009) and also there will be many Europeans and Pro Skateboarder national!. Then, Milton Martinez (Argentina, winner in 2008 and 2010) will be trying to replicate his past successes. The presence of skateboarders at this level is to demonstrate that the World Cup Skateboarding tour is consolidated in a country that only in recent years has been able to offer opportunities for comparison with national skating competitions and world-class skaters. This year, The Spot is proud to announce the partnership with us to invest as Cineskatepark.it Main Media Partner of the event. "All this was possible thanks to a great response not only in Italy and abroad but also in Skateboard Street (graffiti and music), thanks to our innovations and all the countless features every day users who choose to join our Family, we have invested in The Family Spot WCS and Red Bull an important role in two world events such as the World Cup Skateboarding 2011 Red Bull Manny Mania and the only Italian "
Check cineskatepark.it and www.thespotskate.it for more info on the event, live updates, with new exclusive preview. The full results of the contest and the video are available on isTia, log-on!